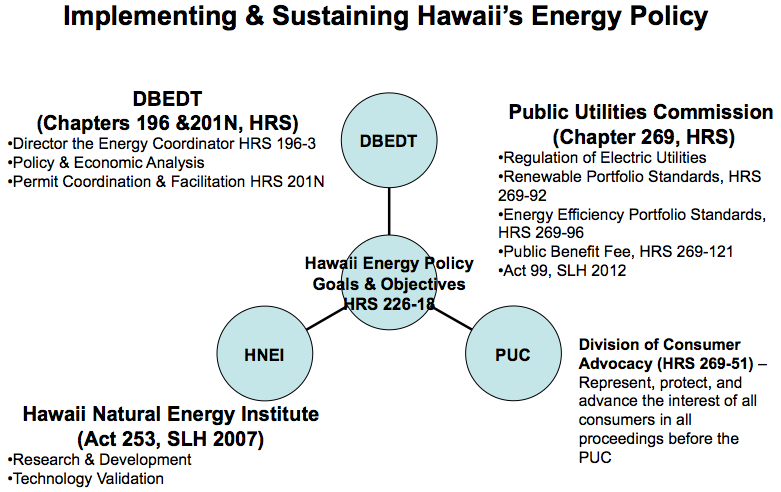 Update: I want to thank an alert reader who pointed out that I misread Governor Ige's position on the PUC's net metering decision. As pointed out in his comment, the Civil Beat article's sentence reads "Ige does not disagree with the PUC's recent decision to cap the so-called net metering . . ." My sincere apologies to the Governor for my mistake. Although it was my misreading of his position that prompted me to write this piece, I still feel strongly that there is a need for some deference to agencies that have been mandated to address these types of major planning and execution efforts that span beyond political terms. It is unfortunate but the biggest threat to a successful and affordable clean energy future for Hawaii is the Governor himself. It pains me to write this because I truly respected his thoughtful approach as a Legislator and his desire for transparency when he campaigned for Governor. I viewed his background as an electrical engineer and his "wonkiness" as assets to understand the systemwide challenges in achieving a clean energy transformation. I had hoped his experience as the Senate Ways & Means Chairman would make him extra sensitive to the need to mitigate the cost implications of this transformation and the need to move forward in the most affordable way to benefit all residents and businesses throughout the State. And, I had hoped, given his experience in the telecommunications sector and advancing technology issues, he would understand the leadership issues and organizational cultural changes that must happen for a systemwide transformation laced with many uncertainties. However, observing his recents pronouncements (his statement on liquified natural gas and the HECO-NextEra acquisition and merger), and now reading yesterday article in the Honolulu Star-Advertiser and today's Civil Beat interview, left me more confused as to what is his game plan. His second guessing the Hawaii Public Utilities Commission recent decision and order ending net energy metering was very troubling showing no empathy for the ratepayer who cannot afford or can have access to a rooftop photovoltaic system (affecting close to 80% of HECO's customer base) or understanding the systemwide technical challenges which affects cost and reliability, thus prompting me to write this post. I am, however, still hopeful for a course correction and that he can and will recognize the need to allow our state agencies to advise him on energy policy rather than just having opaque, dictatorial pronouncements come from the Capitol's fifth floor. I have worked on clean energy policy and its implementation for close to twenty years under four very different administrations and ten election cycles. 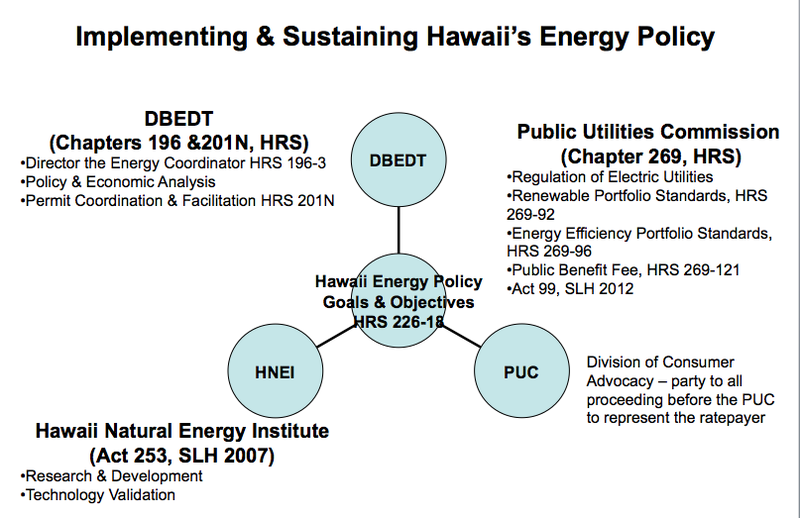 During that period I saw the need and worked with state agencies, the utilities, individuals, businesses and other organizations to help resource and build the capacity of agencies like the Public Utilities Commission, the Division of Consumer Advocacy, the energy office within the Department of Business, Economic Development & Tourism, and the Hawaii Natural Energy Institute knowing that a systemic energy transformation required a focused strategic approach, good analytics, and leadership that could survive through and beyond political election cycles and an administration change. Since clean energy has become such a hot issue in the past decade, it is understandable each politician wants his or her initiatives adopted for their branded clean energy legacy. However, we if desire a system transformation we cannot keep reinventing the wheel nor let one's own prejudices or lack of information get in the way of careful and strategic analytics, therefore, deference must be given to the agencies we have invested in and resourced to help lead this major effort to ensure continuity. Anything less will always have the propensity of letting good planning efforts sit on the shelf in some bureaucrat's office as the wheel gets reinvented for political purposes. We have one opportunity to get our clean energy system transformation right and failure is not an option. hoped to see many successes in your tenure. You have many highly dedicated public employees who want to do their jobs well. It is understandable that you have the bully pulpit when speaking on the State's most pressing issues, but unfortunately, uninformed and premature comments coupled with a lack of transparency and just plain pronouncements are difficult to accept. Therefore, unless you, yourself, are willing to investigate and delve into the volumes of information and input required in some of the most formidable decisions the State must act on to forge Hawaii's clean energy transformation to achieve our clean energy mandates, let these agencies do their jobs. Seek these agencies' input to advise and inform you. You have every right to hold these agencies accountable for balancing the needs of Hawaii and upholding the public's interest to advance the best path forward but it is not wise to usurp efforts without justification, correct information or without better, more cost-effective alternatives offered. "Ige does not disagree with the PUC’s recent decision to cap the so-called net metering program that allowed solar customers to sell their excess energy back to the utility at very favorable rates, meaning some people were paying off their systems in less than five years. The PUC grandfathered in people who already had a permit for their systems but cut the incentives for new installations. That has prompted prominent solar companies to try to overturn the decision in court. But the governor made clear he believes the solar market has matured enough so that taxpayer support is no longer necessary to spark momentum for solar. “I do think that the penetration of solar is a direct result of the tax credits and some of those incentives, and clearly Hawaii is leading the country in penetration,” Ige said. “But the flip (side) of that is when you look at the tax credits and some of those kinds of incentives, when you have return-on-investment calculations that are less than five years … maybe that was too generous.”"